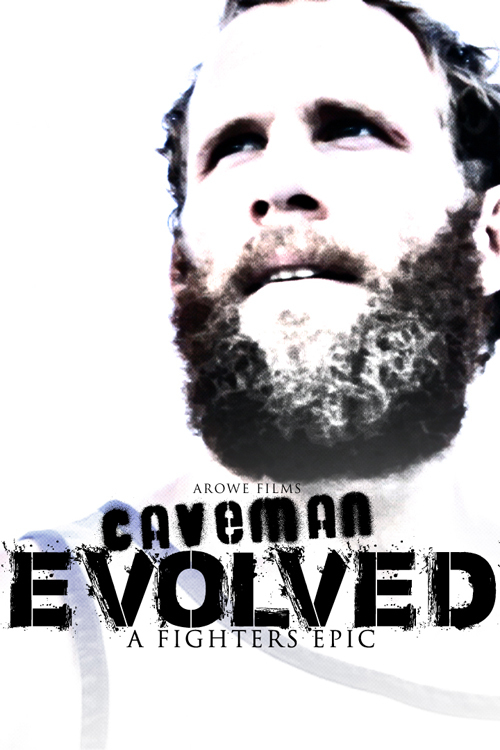 The Pulse of the Caveman – aRowe Films and Ent. I think its about to be roughly a year from when I first met David Rickels and it has been one of the most amazing growths I have seen in a person. Its funny how he has contrasted Amancha from Wifi at Rock Bottom. As she has struggled with surviving addiction and rehab David has been on this path of just being better moment by moment. I came into his world at a time when he was making alot of changes. As he says he wanted to be a more professional fighter and doing that required alot of change. I came along when he made one of what seemed like his most important change and started with a new trainer Marquis Bradley. When he made this change it shifted the production of Beware Caveman because I did not know the story I wanted to tell and how he trained with his previous trainer compared to Marquis was an entirely different style and intensity. I saw both and Marquis would not allow David to mail it in. 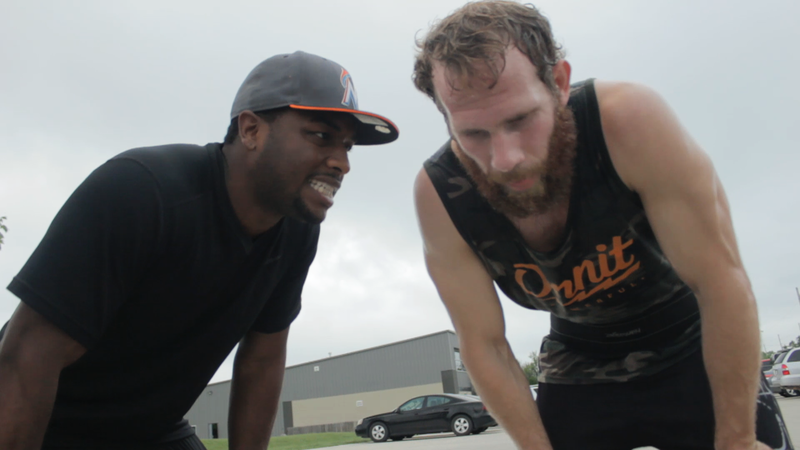 David is like a celebrity in Wichita and either Marquis did not know or did not care but fortunately for Dave it help break him down into being a better conditioned fighter. This would lead me to the theme that I see around David that you don’t expect to see much of and thats raw honesty. No one in his camp is along for the ride. They are there to make him better either physically or mentally. IF he is messing up David knows it but they are there to confirm it or remind him. David at times gets frustrated with him self and and tries to work his way out of it but the camp is always there to keep him thinking smarter and less erratic. Joe Wilk at first seems like another fighter and training partner. When I first met him they were going back and forth with an intense street training session working the gloves and jogging up and down hill. A year later, I am seeing Joe is really the heart of the camp and Davids pulse. I dont know how David feels and I have never asked but I think Joe is why David has became such a more solid fighter. Joe has lost his last two bouts on the Bellator card which could make it seem as if my observation is wrong but, Joe is older with more fights going against younger gunslingers. These guys have to prepare for Joe as a high level grappler and tough guy overall. Joe has a ton of respect for the sport, his frustrations are short lived, and always has respect for the referees choices in handling the fight. 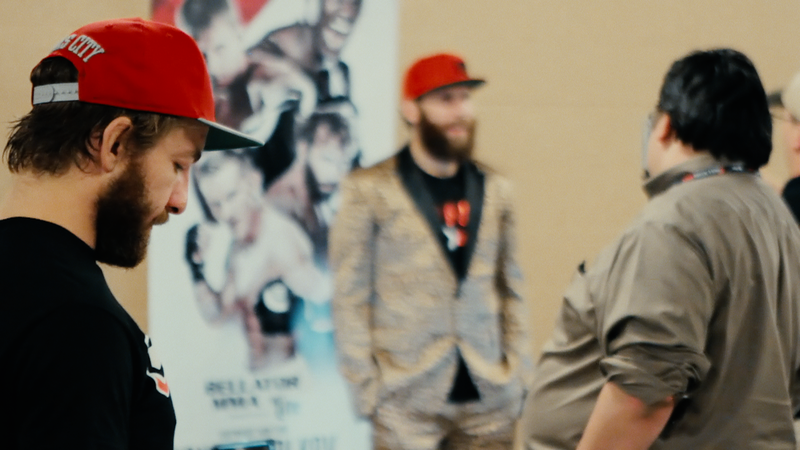 Joe has the ability to switch hats and become Daves closest motivator for a fight. He puts his match, results, and injuries behind him and with great attitude and amazing spirit helps David get his mind prepared for the biggest moment in his life at that moment. Joe and Dave are like one entity. David shows the most vulnerability when with Joe and talking to him. I think he may be most honest to Joe and with himself when Joe is there to be leaned on. Although Wilk is senior to Dave you can see the admiration Joe has for him. He compliments and sells Dave like no other to anyone who will listen. When its time to be vocal and honest with David Joe has zero issues being frank even when you can tell it is beginning to irritate Dave. In a mirroring type of attitude Daves irritation quickly fades as if he was never just annoyed. Their kinship is amazing! 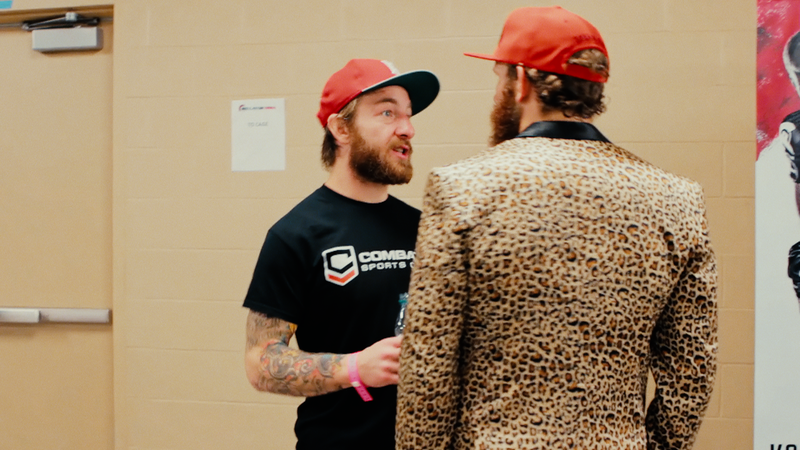 Outside of the filming I have done, one thing we hope to do for caveman is for all his fights provide the audio of Joe Wilk when he is in Daves corner. This gives you the raw feelings and experiences that are happening in those big moments during a match but it also gives you everything before and after. I sit and listen to this raw audio. Usually its an hours worth and I hear Joe and Dave share frustrations and talk about everything surrounding the matches from the strategy to the prize purse. Alot of this I could not and would not ever put out to the public as it is sensitive and private conversation. Relax its nothing inappropriate. Its just as a person you know there are things you don’t mind the public knowing and there are some things that needs to stay in the circle. Listening to the stuff in and out of the circle and being backstage watching how they interact its like good poetry. We would all be lucky to have a friendship full of honesty and respect. We would be double lucky to have those things and work together. 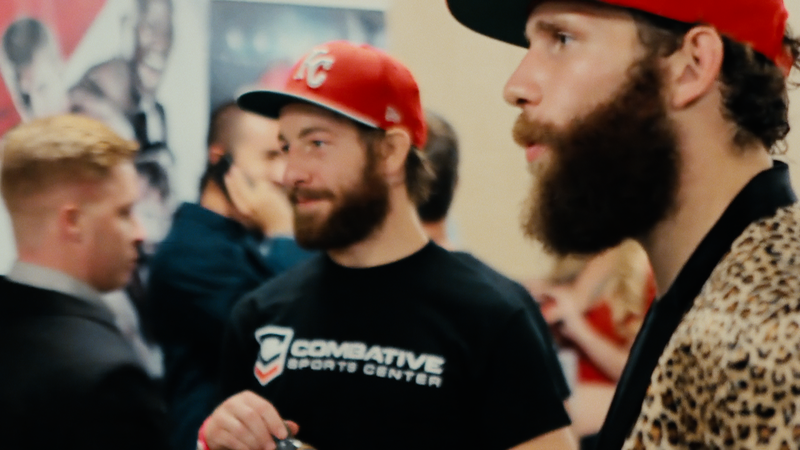 Watching them talk about the Bellator139 fight and the stunning results while waiting to do post fight media was student/mentor, best friends, brothers, and career advisers all rolled up into one. 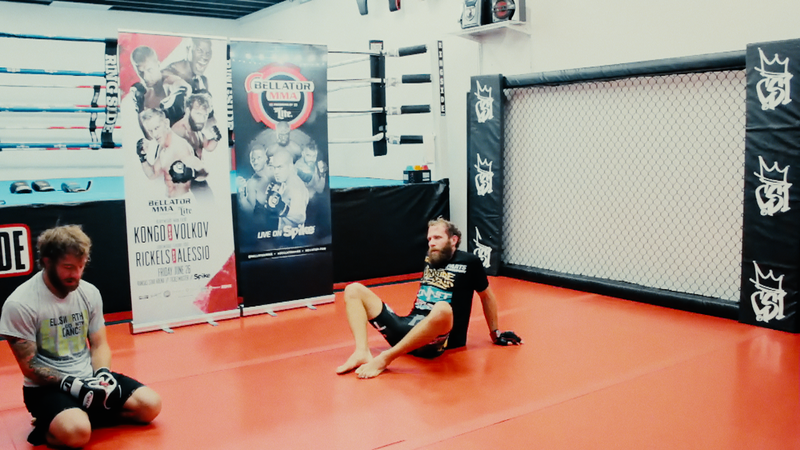 I have made 2 film projects for David Rickels and he has talked about the mental and physical aspect of his training in order to be a better fighter but also I think being in positive relationships in life is an intangible that also makes a difference. Being involved in his life for two fights and knowing about him for 3 on top of watching all Daves previous fights, you can see a more and more positive person fight to fight. You can not fake that in a camp. You can not train that in 8 weeks. That is something that comes with having close friendships like with Joe and relationships like that of his and his high school sweetheart and being a father which you can tell he adores being a parent. This energy feeds over to the crowd who he will not turn down a hug, hand shake, photo, nor autograph. He feeds off of those fans and that’s another extended relationship in his life that’s positive. Maybe I have dranked the juice because I have somewhat invested in the story but David Rickels will be one of if not the biggest home grown star for Bellator the moment they take a moment to invest more into make him apart of their plans. His life story line writes itself and very little of it has to do with how he trains or his record. Alot of it has to do with his ability to connect with people and form lasting positive relationships that influence others along with himself. I can personally say I have seen a Caveman Evolve! 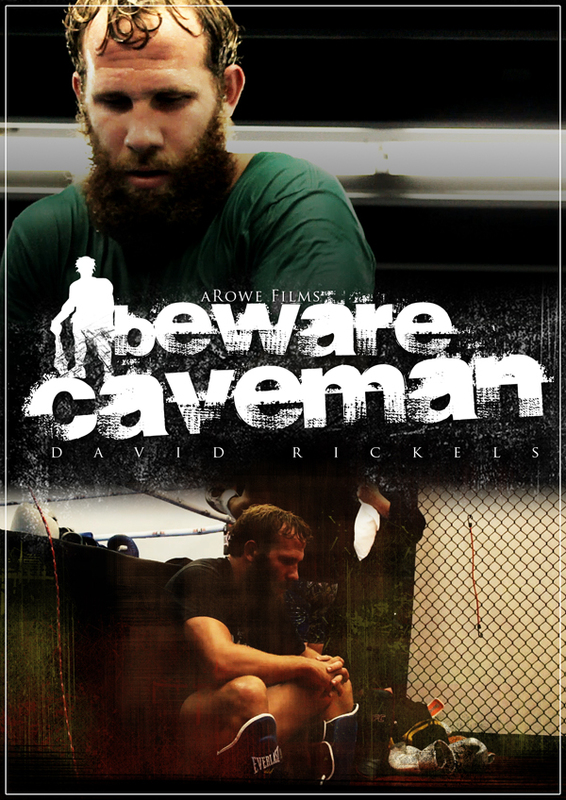 Watch Beware Caveman or Caveman Evolved feature David Rickels in both his journeys to his Bellator MMA Fights. More Content for Caveman Evolved still to come !